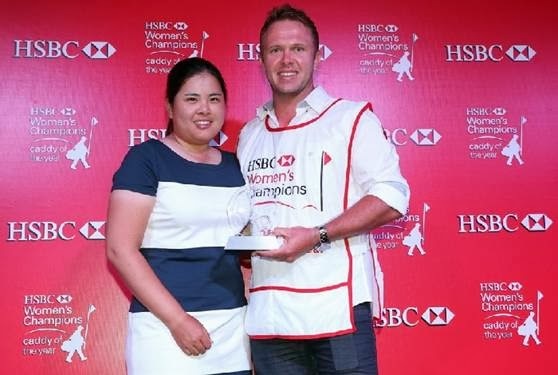 Brad Beecher, Inbee Park's caddie for the last eight years, has been voted the HSBC Caddie of the Year after a 2013 season in which his player won each of the first three majors and six victories all told. The Australian bagman was wearing his prized Caddie of the Year bib as he and Park set off on the third round of the HSBC Women's Champions in a bid to haul themselves up the field after opening rounds of 70 and 72. At two under, they were trailing Karrie Webb by a by-no-means insuperable seven shots. At the awards ceremony on Friday night in Chijmes, Beecher insisted that his award was 100% down to Inbee and that she had been a wonderful and caring employer from the moment they set out together in 2006. Inbee, who was called to the stage, stayed put only for long enough to pay tribute to Brad's enthusiasm and organisational skills. "I don't want to stay up here," she said, "because this is Brad's moment and he deserves it." At the turn of the year, when Park was receiving her Player of the Year award, she had made a rather more detailed reference to her right-hand man. "He has been next to me when I had to make tough decisions on the golf course and I cannot count how many times he saved me from taking poor shots. "Whenever doubt creeps in, he's there and helps me commit to my shots. Without his support, I would not have performed at the level I have this year. "Off the course, I never hear him complain when I ask him to do some tedious task. He gets along with my family and is even more thoughtful towards them than I am." The award for the "Most Dedicated" caddie went to Chella Choi's father, Ji Yeon. Ji has had a handful of second places with his daughter, the last of them at the recent Australian Open where Chella had a 62 to lead the field before losing out to Karrie Webb. He has always said that he will retire as soon as he gets a win, only the win in question has to be hers rather than his.